“Raise your hand if you’ve ever been suspended,” Dr. Prince White recalled asking the young men in the support group he leads at Urban Peace Movement, an organization that teaches Oakland youth about social justice. Twenty-five hands went up, he recalled, as all of them— African Americans between ages 16 and 25—admitted that they’d been suspended at least once in their lifetimes. Daniel Losen, director of the Civil Rights Project at the Center for Civil Rights Remedies, said he and a partner, economist Dr. Russell W. Rumberger, director of UCSB’s California Dropout Research Project, tracked a cohort of tenth graders in all 400 school districts across California between 2011 and 2014. They discovered that in all districts, graduation rates were much lower for students who had been suspended compared to students who had not been suspended. According to their study, out of the 2,874 students in the Oakland Unified School District (OUSD), 459 had been suspended between 2011 and 2014. The graduation rate for non-suspended students was 68.8 percent and 38.8 percent for students who were suspended. The study shows that 482 out of 2,162 students were suspended during those same school years in West Contra Costa Unified School District (WCCUSD), which covers schools in Richmond. The graduation rate for non-suspended students was 82.7 percent, and 56.4 for students who were suspended. Losen and Rumberger also broke down the cost of suspensions over this cohort’s lifetime by district. Suspensions of OUSD students alone would cost the surrounding communities $17 million over the lifetime of the observed students, they estimated. Communities surrounding WCCUSD would suffer an $18 million loss. Gorham added that suspended students often later end up in the criminal justice system. “Suspension is one of the school-to-prison pipelines. It is a punitive measure. We find that even retention of students causes dropouts later,” she said. Losen and Rumberger estimated the $2.7 billion statewide loss based on economist Clive Belfield’s research on the costs of high school dropouts and suspensions. They projected the financial burden of this cohort between ages 18 and 65 by using Belfield’s economic model and broke the costs down into four general categories: earnings, crime, health and welfare. Although Losen and Rumberger’s research does not include how much suspensions cost schools, state-funded schools lose funding when students are absent, regardless of the reason. According to OUSD spokesperson John Sasaki, the district receives $67.61 per day for each attending high school student. This is called ADA, or average daily attendance. Losen and Rumberger’s study also shows racial disparities in suspensions. According to the study, between 2011 and 2014, African American males represented 7 percent of the California’s 10th grade student population, but 15.6 percent of suspensions. They found that 29.2 percent of African Americans and 16.2 percent of Latinos in California schools were suspended over the three-year time span. The statewide average for suspensions of all students within the sophomore to senior year cohort was 14.9 percent. 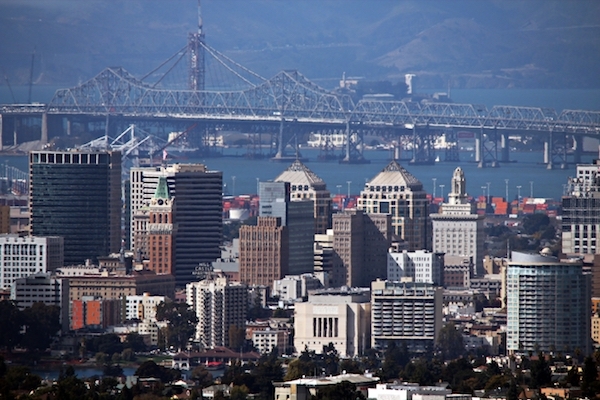 In Oakland, school officials have grappled for years with similar racial disparities. In May, 2012, the federal Office of Civil Rights (OCR) reviewed OUSD’s discipline practices and discovered disparities between how African American and white students were disciplined. Urban Strategies Council, an Oakland-based non-profit for family educational and employment support also studied the district that year and found one in five African American male high school students were suspended during the 2010-2011 school year. Their study also states that while that same year white male students missed fewer than 250 days of school because of suspensions, African American males missed nearly 6,000. In September, 2012, the school district passed a voluntary resolution plan as a result of OCR’s findings, which would revise disciplinary policy over the next five years. These revisions included using alternative options for suspensions, such as parent-teacher conferences, interventions and adopting problem-solving strategies. Theresa Clincy, the OUSD director of Attendance and Discipline Support Services, said the district is moving away from suspensions and encouraging teachers and principals to use them as a last resort. Clincy said suspensions hurt students the most. “They lose instructional time. This means that they also suffer isolation. They’re more exposed to being brought into the juvenile justice system,” she said. Clincy said they’ve adopted alternative interventions for disruptive behavior, a system called Positive Behavior Interventions Support, or PBIS, which she called a more proactive way of dealing with misbehavior. It focuses on three tiers of behavior management. The first step is for school leaders and teachers to model acceptable behavior, like being respectful and resolving problems. The next step is to provide small group support, including counseling, and individualized support, which could include a conference with the student’s parent. But Clincy said any violent action—including possession of weapons or drugs, or sexual assault—still results in an automatic suspension. Like the OUSD, WCCUSD has also adopted PBIS and a method called restorative justice, which have led to a decline in suspensions. Restorative justice requires teachers to provide community-building through conversations immediately following a disruption, family-group conferencing, and accepting students back to the school community after the disruption. But, Gonzalez said, providing that costs more money. “To support these methods we need to see an increase of funds that go to the sites so that the sites can properly advocate for what they need to grow their program,” he said. Staffers at some schools say they’ve already seen success with using these methods. At Hoover Elementary School in West Oakland, instead of suspensions detentions, this year the staff has used breathing exercises for students who feel angry, or recommended music or reflection time. When those tactics don’t work, students’ parents are invited in to discuss the issue. So far, the staff have not suspended one student this year. “This year we haven’t had any suspensions, but that doesn’t mean we haven’t had any problems,” said restorative justice coordinator Adimu Madyun. He said when there’s a conflict between students he works with, teachers, parents and students to resolve the problem, rather than remove the student who “initiated” it. He said it’s up to the school leaders to make the student who’s been removed feel wanted again and to make all students feel safe. Madyun said many of the students who exude anger have a valid reason, ranging from lack of sleep because their parents were working late or hunger because they can’t afford to eat breakfast. Another program that works to fight for fair discipline and achievement for a district’s African American students is the OUSD’s Office of African American Male Achievement (AAMA). Their programs include the Student Leadership Council, which encourages middle and high school students to participate in school councils, and the “Manhood Development Program,” a mentoring program that operates in 17 Oakland schools. AAMA’s program director Jerome Gourdine said these programs are important because they teach young men how to express themselves. “It creates a momentum of leadership. We’re bringing a voice to the voiceless — our African American males,” he said. When it comes to students who have been suspended, AAMA makes sure they receive fair treatment. Gourdine said, “Sometimes we advocate for an alternative instead of a suspension. We’re accessible to their families if they need support in deciding whether they felt that suspension was justified or not.” Gourdine said their work benefits parents, too. “Parents feel really empowered to know they have someone who’s an expert in the school system that can support them,” he added. According to AAMA’s research, suspensions among African Americans have slightly dropped from 6,890 during the 2011-2012 school year to 6,321 during the 2013-2014 school year. AAMA’s data, published in August, 2014, shows graduation rates among African American males increased from 46.6 percent during the 2010-2011 school year to 50.6 percent 2011-2012 and 52.4 percent during the 2012-2013 school year. Dropout rates among the same demographic dipped from 35.6 percent to 30.8 percent to 25.8 percent over the same time period. West Oakland’s Castlemont High School in particular showed “high” improvements in reducing overall suspensions according to the 2015-2016 School Performance Framework, a study by the district that examines its schools’ academic and cultural performance. “We’ve made a change in terms of the recognition of African American males. But there definitely is a lot more work to do,” Gourdine said, adding that more research needs to be done to determine the district’s progress, which will require more funding. Prince White, the program coordinator for Urban Peace Movement, said he sees those disparities being reflected among the young men he mentors. Not only did all 25 of the participating young black men in his group admit to being suspended, White said, but one quarter of them said they had been expelled before, too. One young man from Stockton said he had been suspended 54 times by the time he reached 8th grade. “Look at how they’re treated at school from metal detectors to disproportionate detentions and suspensions. Treatment is terrible,” White said. White said he uses the young men’s experiences to help them talk about the school-to-prison pipeline so that they can change the system, rather than succumb to it. Youth UpRising (YU) is another community organization working to combat suspensions in schools. Hannah Kahl, the group’s education manager, said they currently provide counseling to troubled students at Castlemont High School. They also provide afterschool programming at their community facility—classes like SAT prep, video production and graphic design—which according to Kahl, promotes better behavior and academic performance. According to Kahl, afterschool programs generally keep students on the right track. “Teens who do not participate in afterschool programs are nearly three times more likely to skip classes at school than teens who do participate,” she said. She added those who don’t attend afterschool programs are three times more likely to fall into other mischievous activities including drug and alcohol use and sexual activity than teens who do attend such programs. Destiny Iwuoma, college access coordinator at the Richmond RYSE Center, said it’s important for afterschool program staffers to be allies for students who have been suspended. RYSE provides afterschool activities similar to Youth Uprising, as well as college readiness programing like a free college campus tour that goes to several campuses in southern California. Losen said he hopes the study will encourage instructors to think twice about suspensions, to benefit students, schools and communities. He used to be a teacher himself, and admits that he had trouble managing his classroom at first. Gorham pointed out that ultimately a principal, not a teacher, makes decisions about suspension. “Teachers don’t suspend at all. Teachers do not have the power to suspend students from school. Only an administrator has that power,” she said. While teachers need support, Gorham added students on the verge of suspension need support, too. “No one wants to suspend a student from school. Nobody benefits from it. Kids need to stay in school,” she said. This story was updated on April 26 to correct the OUSD’s suspension policy. Suspensions are not automatic, but students can be suspended in cases of violence, sexual assault, drugs or weapons. Urban Peace Movement’s youth member Joel Reyes facilitates a chess lesson for DetermiNation Black Men’s Group. The group teaches Oakland youth about social justice, and its leaders argue that minority students are disproportionately affected by school suspensions. Photo by Prince White. West Oakland’s Castlemont High School in particular has shown improvements in reducing overall suspensions. Photo by Rachel Loyd. Unfortunately, due to the OUSD budget crisis, my kids’ school’s restorative justice program will be cut by 50% next year. I think it is a great program, but we need to make long-term financial commitment for it to really work and not become one of those flash-in-the-pan educational fads. I’m Rachel Loyd, reporter on this story. Please shoot me an email at rachelloyd2@gmail.com. I’d like to hear about what changes you’ve seen with the restorative justice program at your children’s school this year.